If you’ve always wanted to visit the Kimberley coast, now is your chance. One of Australia’s favourite ships, the Sea Princess, offers a fantastic 28-night cruise all around Australia that travels to multiple bucket-list destinations, including the stunning Kimberley coast. The Kimberley is an integral part of Australia’s cultural identity, but remains a place that few travellers have been lucky enough to witness themselves. So if you’ve been wanting to explore this region’s many wonders, here are five swoon-worthy suggestions. The Kimberley is home to some amazing and beautiful places but one of the coolest travel spots to visit is the Horizontal Falls, located deep within Talbot Bay in Buccaneer Archipelago (a group of islands off the coast of Western Australia). The falls are formed by the massive tides that rush through narrow gaps in the surrounding gorge — the result is the famous ‘horizontal waterfall’. For the best views of this extraordinary site take a seaplane out from either Derby or Broome, or ride the rapids on a high-powered fast boat. The world heritage listed Bungle Bungle Range in Purnululu National Park is a highlight of any trip to the Kimberley. These distinct beehive-shaped sandstone rock formations boast stunning orange and grey colourings and are truly a feast for the eyes. 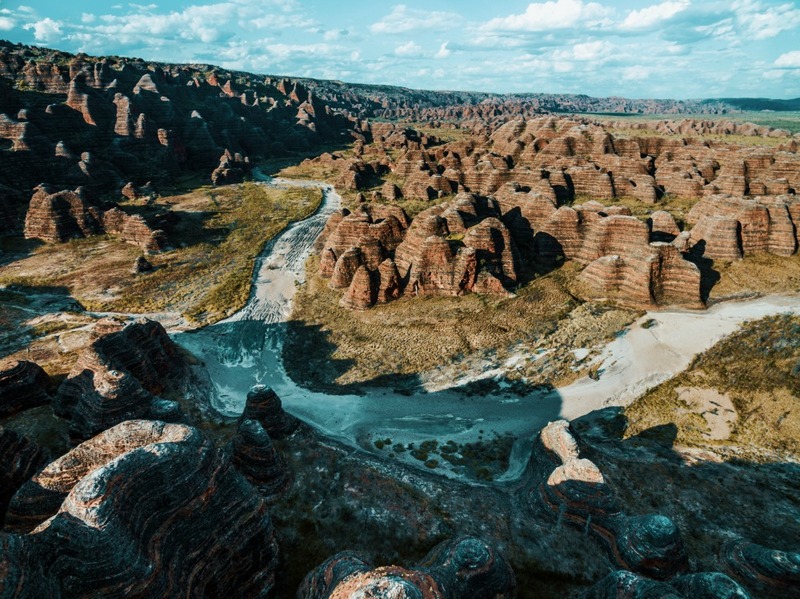 The beauty of the Bungle Bungle Range is best captured from the sky so consider booking a scenic flight the absorb the majestic view from above. Montgomery Reef, located off Doubtful Bay, is a particularly outstanding coral reef covering some 400 square kilometres. Thanks (again) to the massive tides in the area, the coral reef is submerged when tides are high, but at low tide it emerges up to five metres out of the water. The tide drops rapidly and the water cascading from the top of the reef creates hundreds of waterfalls. You can witness this incredible sight in a helicopter, or explore Montgomery Reef in a boat for a chance to see marine life including turtles, dolphins, saltwater crocodiles and dugongs. The King George Falls, located in the North Kimberley Marine Park, is quite possibly the most extraordinary natural attraction in the country. They’re the highest single-drop waterfalls in Western Australia, plunging 50 metres over towering sandstone cliffs. You can take a six-hour hike to the top of the falls, or take a boat to explore the falls close-up. A trip to the Kimberley just wouldn’t be complete without a visit to Broome’s world-famous Cable Beach, where the sand is white, the waters of the Indian Ocean are almost impossibly clear, and the sunsets are legendary. A camel ride along these glorious 22kms is real bucket-list stuff. Have you been to the Kimberley before? Which of these beautiful locations is next on your bucket list? Rail, tour, fly and self-drive! Perth Getaway - Rottnest Island, Swan Valley & more!